It's the way you take in information through your five senses and make that information meaningful to you. Your Perceptual Style acts as a filter between sensation and understanding. It's at the core of who you are, and it impacts your values, your beliefs, your feelings, and your psychology. The decisions you make, the actions you take, and the directions you choose are all influenced by your Perceptual Style because it defines reality for you. The only way to recognize and claim your Perceptual Style is thru the scientifically developed, Internet-based Perceptual Style Assessment (PSA). The assessment takes 30-40 minutes, and if you are interrupted, you can save your answers and continue at a later time. 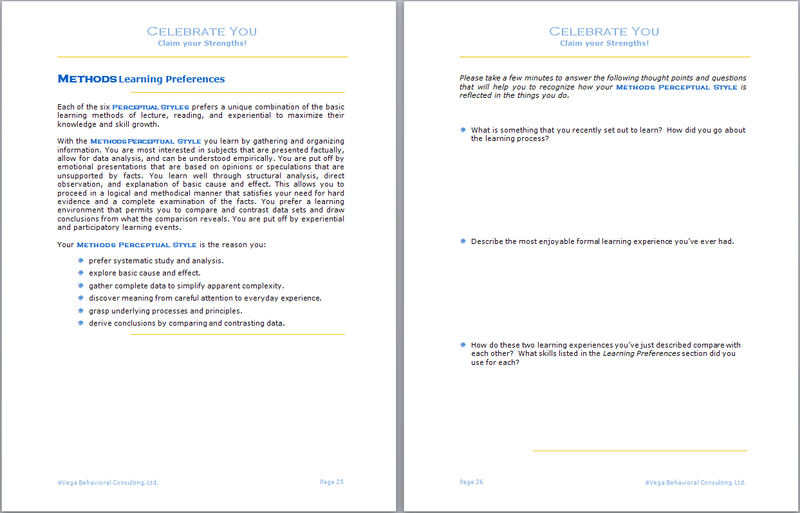 And best of all, you’ll receive your results - Volume 1: Celebrate You of the Your Talent Advantage Owners Manual series - almost immediately after you submit your assessment. Imagine having the power of putting your natural strengths to work for you in all aspects of your life! All for $49!